Heat the oil in a large, lidded, heatproof pan or paella pan. Fry the chicken until the pieces are evenly browned, turning them regularly as they cook. You may need to do this in two batches, depending on the size of your pan. Remove the chicken from the pan and set aside. Fry the slices of chorizo in the pan until crisp. They will release their juices into the pan, which adds a lot of flavour to the dish. Add the onion to the pan, and cook gently until soft, then add the garlic and fry for a further 2–3 minutes. Add the red peppers, chillies and smoked paprika, cook for another 2–3 minutes. Return the chicken pieces to the pan and pour in the stock. Simmer gently for 20–25 minutes until the chicken is tender. Add the rice to the pan, cover with the lid and put into the preheated oven. Cook for 30 minutes, or until all the liquid has been absorbed and the rice is cooked. 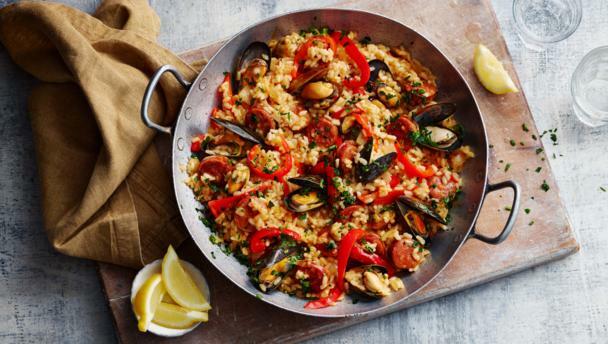 Alternatively, if using a paella pan which won’t fit in the oven, cover tightly with foil and continue cooking on the stove over a low heat for the same cooking time. If using mussels or clams, add them to the pan for the final 20 minutes cooking time. Discard any shells that remain closed after cooking. Check the chicken is cooked by piercing the thickest part of a piece with a skewer – if the juices run clear the chicken is cooked. Sprinkle with parsley before bringing the pan to the table. Let your guests help themselves.